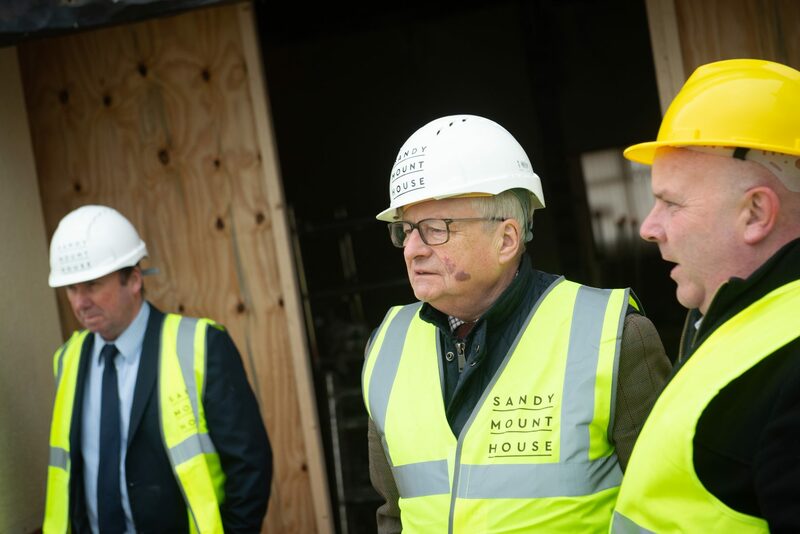 Sandy Mount House, the new destination restaurant, bar with rooms planned for the centre of Rhosneigr, has marked the start of extensive construction and refurbishment works with a visit from the Welsh Government Minister for Culture, Tourism and Sport, Lord Elis-Thomas. Sandy Mount House is being created on the site of the old Sandymount building on Rhosneigr High Street. New owners Louise and Philip Goodwin plan to create a stylish new destination with the help of an expert team including renowned designer, Michelle Derbyshire. With a total investment of over £2million, a complete refurbishment of the existing building and outdoor space is being carried out to create a luxurious and contemporary venue which it’s hoped will attract locals and visitors alike. The development has been offered funding of £260,000 from the Micro Small Business Fund (MSBF) through the Welsh Government Rural Communities – Rural Development Programme 2014-2020, which is funded by the European Agricultural Fund for Rural Development and the Welsh Government. Working with Wilde Architects, the Sandy Mount House build is being completed by family-run, Preston-based builders Parkinson & Hartley and has started with a complete strip-out of the building and various structural changes including the removal of several walls. Once completed, it will feature a 100+ cover restaurant for relaxed family dining, a bar and 7 luxury hotel rooms. The build programme is around 40 weeks in total, and it will be towards the end of the year before the internal fit-out is complete. The venue is planned to be open by early 2019. Louise and Philip have commissioned specialist hospitality consultants One Call Management to manage the operational aspects of Sandy Mount House, and One Call’s Kaushik Mistry has been closely involved from the start of the project. Kaushik said: “We’ve got a great team on board to support us in delivering Louise and Phil’s vision for Sandy Mount House and after months of work and planning behind the scenes, it’s very exciting to see the physical transformation now starting to take place.